Learn about how cinema has captivated the baby boomer audience by providing a unique, high-quality, immersive experience. Global strategies, campaign updates and trends in cinema. 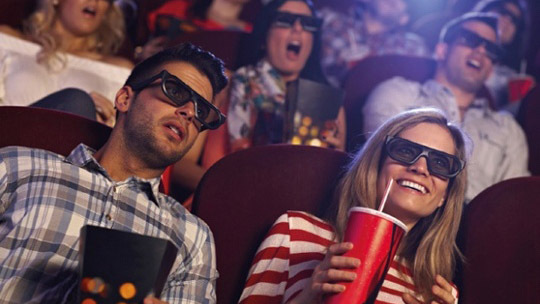 This article explains how using cinema in the media mix can help build brands and deliver impact and cost efficiency in today's cross-media landscape. MESH Experience, the market research company, presented new research into cinema media in a WARC Webinar alongside National CineMedia and Screenvision Media. Fiona Blades, president and chief experience officer at MESH Experience, Doug Pulick, SVP of research at National CineMedia and Sarah Barasch, SVP of insights and measurement at Screenvision Media, analyse how cinema compares to all other touchpoints. If you thought winning Oscars was all about making just making a fine movie, you can be forgiven. Netflix, the US streaming company, is bringing its muscle into traditional studios' domain. The Diamond Concierge, an Australian online diamond retailer, launched an integrated campaign to raise awareness and demystify the purchase of diamonds among a non-expert, male audience. Biti's Kids, a footwear brand, achieved 36% incremental growth by launching an animated film for parents and children in Vietnam. Art Fund, an independent membership-based British charity, increased awareness of its Art Pass in the UK by launching a multimedia campaign, which included a film and Student Art Pass Tinder profile. Godiva, a Belgian chocolate manufacturer, communicated with its audiences in the UK and the US via a single campaign that 'democratise luxury' from boutiques to mainstream luxury shopping aisles. Nissan, a multinational automobile manufacturer, revitalised a dying car in a declining segment by launching a film in the Republic of Ireland, which broke category conventions and shattered preconceptions of its brand. Canada Goose, a clothing brand, increased sales and brand awareness across Europe and North America by launching an integrated campaign that told the stories of five outstanding Canada Goose consumers through an interactive film. Cochlear, a hearing implant brand, created a hearing test in disguise in Australia by launching a film with two possible outcomes depending on the viewer's hearing ability. Godiva, a Belgian chocolatier, looked beyond its traditional chocolate boutique stores and took its luxury products into supermarkets in the UK through a visual campaign that broke category conventions. Das Handwerk, the German confederation of craftsmen, created a movement to encourage young people in Germany to pursue crafts as a career. Burger King, a fast food chain, launched the Loving 'It' campaign in Germany to compete with its rival McDonald's and leverage the influence of horror movie, 'It'. Prudential, the financial services company, used a video distributed through social media to raise awareness of the issue of unemployment among American veterans. RIYADH: Ending Saudi Arabia’s 35-year ban on cinema theatres is one of the liberalising reforms attributed to Crown Prince Mohammed bin Salman and international cinema brands have been quick to respond to the opportunity. Peter McVerry Trust (PMVT), an Irish charity that tackles homelessness, drug misuse and social disadvantage, created brand awareness in Ireland by releasing a cinema ad that shows memories that are only possible when you have a home. This article provides marketers with information and guidance on several major media channels.